How do enrollment caps and wait lists appear in the catalog for a course or program listing? When you create a course or program listing as a Catalog admin, you can set an enrollment cap for that course or program. Enrollment caps let you set a limit to the number of students who can enroll in the course or program. A wait list can be added to a listing as part of an enrollment cap. When an enrollment cap is added to a listing, the enrollment number always begins at zero, regardless if students are already enrolled in the listing. Please make sure that you set your enrollment cap before inviting users to enroll for the listing. Catalog does not verify enrollments against any users who may already be enrolled in a course or program. Users who are already enrolled in a course or program when the enrollment cap is added will not appear in the enrollment count for that listing. Enrollment caps are applied per listing. Course and program listings can have separate enrollment caps, regardless if a course is listed individually or as part of a program. If a course is listed individually for enrollment and as part of a program, and both the program and the course have enrollment caps, the total number of enrollments allowed would be the sum of those cap limits. For the wait list feature to take effect, students must drop courses from the Catalog dashboard. If a student drops a course from the Canvas dashboard, the course will be dropped, but the wait list feature will not know that a spot has become available in the course or program and will not notify the student next in line. Although as an admin you can manage enrollments in Canvas, you cannot directly manage enrollments through Catalog directly. Enrollments should always be managed through the Canvas dashboard to ensure accurate Catalog reports and analytics. If you ever need to drop a student from a course, create a secondary login for the student in Canvas, log in as the student in Catalog, and drop the course through the Catalog dashboard. As part of adding a catalog course listing or catalog program listing, you can enter the maximum number of students who can enroll in the course or program. By default, there is no cap limit. As part of the enrollment cap, you can enable a wait list for the listing. A wait list allows students to add their names to a list to join a course or program when the enrollment cap has been reached. When setting Canvas course or section dates, the Users can only participate in the course between these dates checkbox should be selected. If a listing contains a fraction in the Enrolled column, the listing includes an enrollment cap. You can view the current number of enrollments compared to the maximum number of enrollments. You can also view the enrollment cap when you edit a listing. Course and program listings can have separate enrollment cap limits, regardless if a course is listed individually or as part of a program. If a course is listed individually for enrollment and as part of a program, and both the program and the course have enrollment caps, the total number of enrollments allowed would be the sum of those enrollment caps. Catalog does not enforce enrollment caps when a student is moving from one program course to another. For example, if a program with 20 enrollments also contains an independent course listing with 3 enrollments, there would be 23 total enrollments for the course. Please be aware that total enrollment caps are only enforced at the level for the listing where you want to apply the limit; any nested listings (such as another subprogram) don't apply to the limit. Users won't know the number of seats remaining for a listing until there are fewer than 20 enrollments. After that number, users can view the number of spots remaining. If a wait list is enabled, once enrollment is closed, students can add their name to the wait list and be automatically enrolled if a spot opens. You can view the wait list at any time. Spots can become available if a student drops a course or program, or if you increase the enrollment cap in the listing. Note: Students must drop courses from the Catalog dashboard for the wait list feature to take effect. 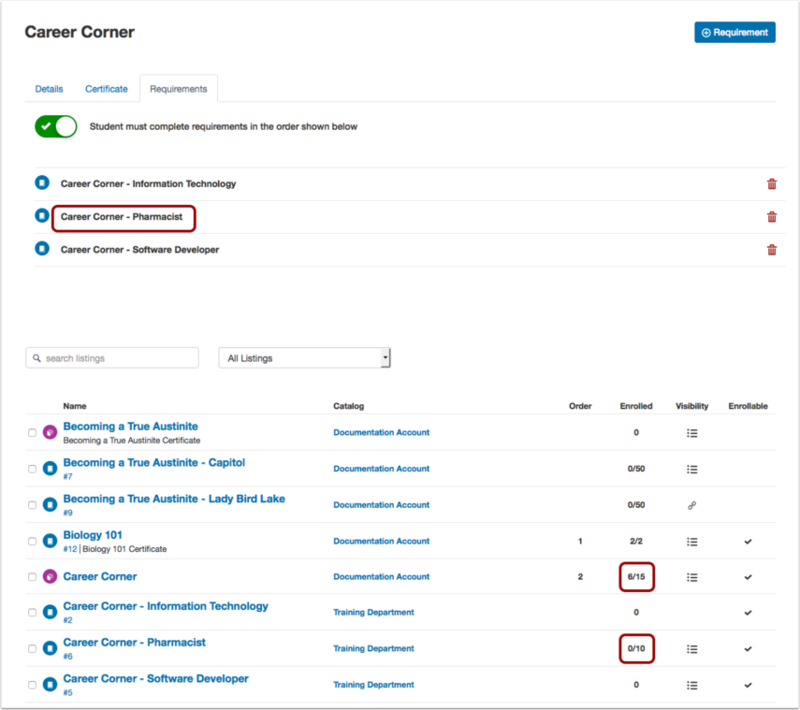 If a student drops a course from the course dashboard in Canvas, the course will be dropped, but the wait list feature will not know that a spot has become available in the course or program. If the wait list is enabled and you increase the enrollment cap for a listing, Catalog alerts you about the wait list changes. When you click the Save button for the listing, Catalog shows the new enrollment cap, as well as the number of wait list individuals who will be enrolled. To save the enrollment cap changes, click the OK button. Previous Topic:How do I add a catalog program listing? Next Topic:How do I view the wait list for a catalog course or program? Table of Contents > Admins - Catalog > How do enrollment caps and wait lists appear in the catalog for a course or program listing?